Gauntlett: When I checked Kickstarter this morning, you were over 400% funded [Â£40,000+ on a Â£10,000 ask], and you still have over 20 days to go. How do you design stretch goals, and is there a stretch goal you'd never do? Hite: We show one stretch goal at a time, and have a batch ready for reveal. The way we did it was, we went through list and decided what kind of goals we wanted, whether production, nicer art, things like that. We wanted to be able to put more stuff into Dracula, to have the resources to write Van Helsing's notes, since Van Helsing is an enigmatic figure even in the novel. Some of it is just more stuff that we can put in to the book, in terms of encounters and NPCs. Gareth Ryder-Hanrahan, my co-author, and I went back and forth talking about cool things, saying 'Let's have him go to Turkey, because Dracula - if he's Vlad Tepes at least - goes to Turkey, and in the novel Dracula hates the Turks, so we can drag the Turks into this.' We noticed that Italy shows up in the origins of the book, sort of, so we figure out what's vampiric or conspiratorial in Italy. I came up with some of what we call capstone scenes, or finales; one of them has Dracula vampirizing Putin in an attempt to end all this foolishness of sneaking around, so he can just rule Russia and be in control of nuclear weapons. Another capstone features a place in Romania called Dracula's Mill, a waterfall that goes down into a cave, and it seemed like a good Eiger Sanction scene, with a physical confrontation mixed with a little Descent -style dungeon crawling adventure. Depending on the kind of ending you want, you choose the capstone that suits. Finally there's stuff that can be added either as part of the dossier as sidequests or as part of the major campaign. We do offer props as part of our backer reward levels. There's an Ouija board and vampire hunter's kit there at the 'I am a much bigger fan of Ken and Gareth than I am of my wallet' level [minimum backer level Â£1,000 or more]. Mostly T-shirts, badges and other physical rewards add to shipping costs, not play. It's much better to create goals that are part of play, not just things that you wear. We're a game company, in the final analysis, not a T-shirt company. Gauntlett: One thing that doesn't seem to have been mentioned so far is music or soundtracks, and I know you're a huge James Semple fan. Are music stretch goals likely? Hite: Obviously people will have to rush right out and pledge a lot of delicious pounds to find out, but I will say that if you have dreamed forever that one day James Semple would write a Dracula Suite, the excellent way to make that happen is to keep pledging money and see what shows up. I'm a big fan of James Semple personally; I've never had a soundtrack before and now I have two of them thanks to him. I'd love to go for the trifecta and hear James Semple riff on the greatest vampire story ever told. I think that would be terrific, and we would love to get to a point where that becomes a viable stretch goal! Gauntlett: To close out on a fun note, as you're a huge cinephile, which movie or movies do you feel best exemplifies the Dracula Dossier worldview? Hite: That's a little bit tricky, because there are films that feel like parts of the Dracula Dossier, and bits of other movies that feel like the Dracula Dossier. There was a very terrible movie called Dracula 2000 that began with a heist to break into where Dracula's coffin is stored, so if you just watch the first ten minutes of that movie, maybe that exemplifies it best! I would say you could build a Dracula Dossier movie out of that, and maybe Satanic Rites of Dracula, which is a terrible Hammer film, but which is still one where Dracula's out there conspiring to overthrow Britain as opposed to bothering Ingrid Pitt every now and again! You could use those two and the very mediocre movie The Killer Elite , a nice narrative where two secret branches of the SAS go to war with each other, which again has a good Dracula Dossier vibe to it. The 1977 mole hunt could be a very good Tomas Alfredson double feature, Let The Right One In paired with Tinker, Tailor, Soldier, Spy! 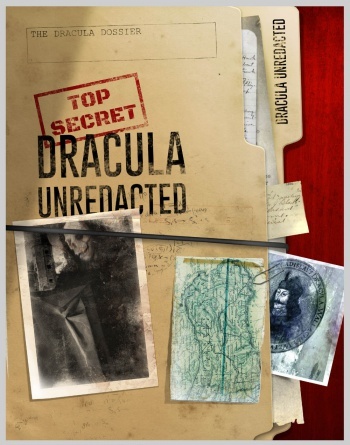 You can check out The Dracula Dossier on Kickstarter or at the Pelgrane Press website. Disclosure: I have backed this Kickstarter, and have written for Pelgrane Press' Trail of Cthulhu.